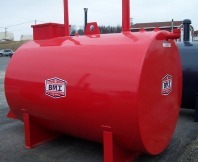 Single Wall Tanks are just as the name suggests – a single wall primary tank only. They are aboveground tanks that are used for the storage of furnace oil for the specific purpose of supplying a furnace or generator. Tanks are equipped with required venting, saddles, and a step or ladder as applicable.